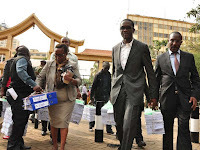 Thursday September 13, 2018 - Detectives from the Criminal Investigations Department have arrested acting IEBC Finance Director, Agatha Wahome, together with suspended CEO Ezra Chiloba’s Personal Assistant, Abednego Ominde, for trying to sneak out files from the agency. According to IEBC chairman, Wafula Chebukati, the two were arrested as they tried to make away with 14 files from the Finance and Procurement Departments. The two are said to have been sneaking out files that had implicated Chiloba in a Sh 250 million scandal during the 2013 General Election. In the scandal, Chiloba is said to have demanded the money from the exchequer to supply additional Biometric Voter Registrations machines but no machines were added. Chiloba is yet to be arrested despite being linked heavily to the scandal.